It's nearly 1PM and I still haven't been able to get my dog outside for a walk. Eugene tried this morning, but he snarled and growled and snapped at him so much that he gave up, leaving it in my hands. My attempts to put on his harness have been similarly successful, ending with him running away and huddling in a pile of pillows or sorted laundry. Hudson hates the winter. He hates rain and cold and snow, and will happily refuse to pee all day if it means he can stay indoors. I don't blame him, as I'd likely do the same were it not for indoor plumbing. Fortunately, working from home means that I can generally avoid going outside on the really bad weather days, and instead stay warm and cozy indoors. 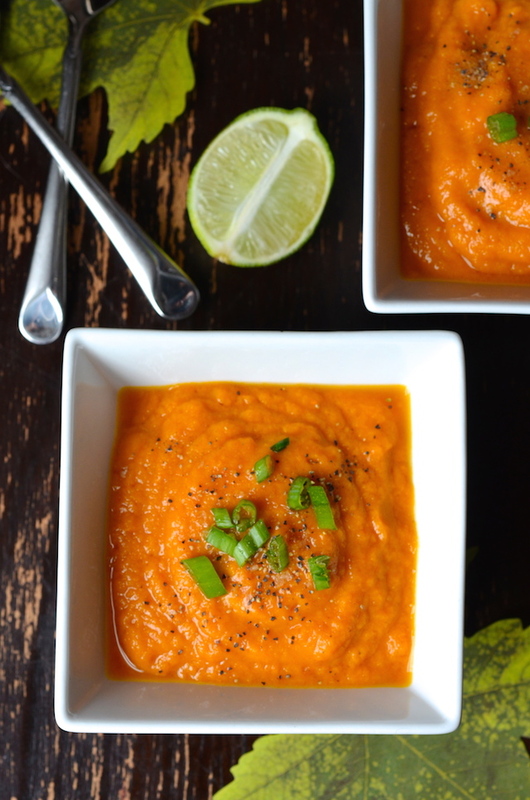 They're my favorite days to cook and experiment in the kitchen, and they're what led to this warm and comforting Roasted Pepper, Carrot & Ginger Soup. There is nothing better than a steaming bowl of homemade soup on days like this. 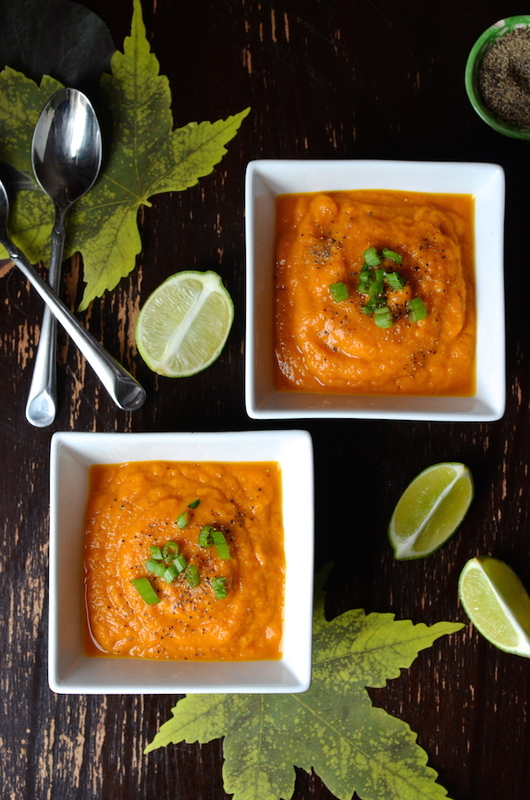 My Spicy Roasted Tomato and Mexican Chorizo with Sweet Potato are two favorites, but this new creamy veggie soup might knock those off the list. It's so easy to make, too! 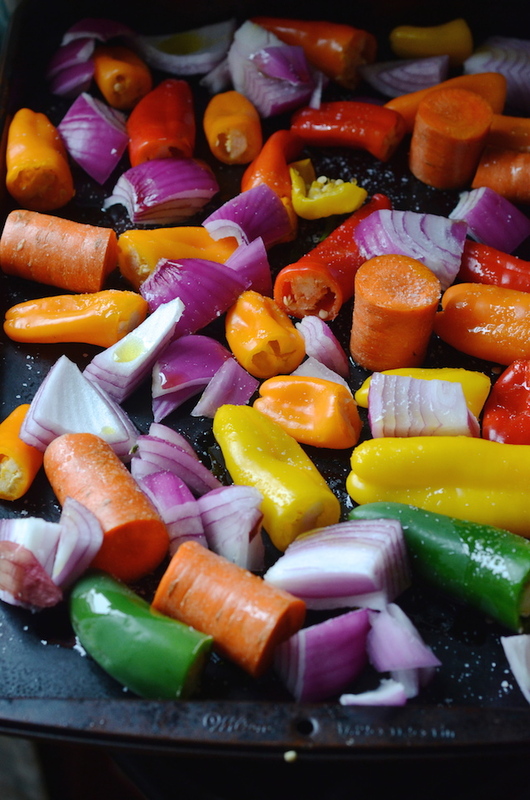 You start out by chopping up a bevy of colorful peppers, some onions, and some carrots and roasting them in a very hot oven. This brings out the natural sweetness and adds a lovely smokiness to the soup. Into the food processor or blender they go, along with some stock, garlic, and a good nub of peeled ginger. 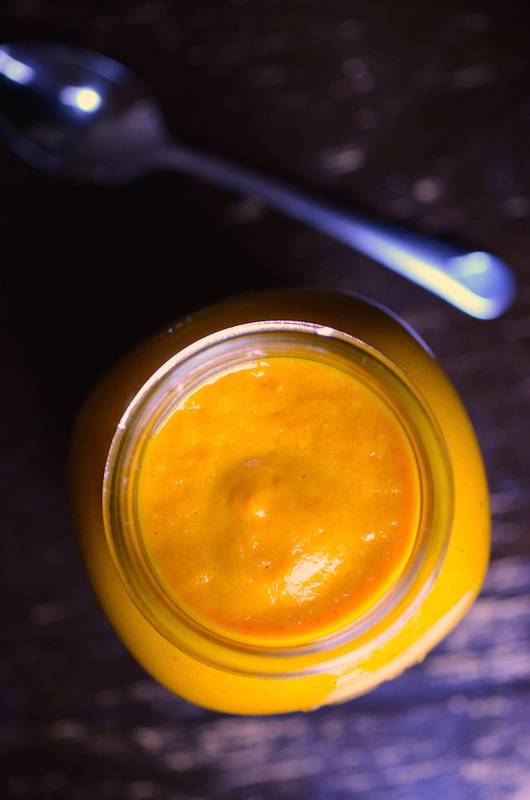 Pureed until very smooth, then seasoned and thinned to your preference, it's a gorgeous soup for cold, winter days. The sweetness of the vegetables plus the spice of the ginger is reminiscent of asian flavors. A squeeze of fresh lime brightens the whole thing up. This makes a big batch, which you can keep in mason jars in the fridge for quick lunches or meals throughout the week. Just the thing to get you through these frigid days. Loved this recipe? Let's connect so you can find out the next time I post! Follow me on Twitter, Instagram, or Pinterest, become a fan on Facebook, or sign up to receive my once-a-week e-mail updates. Preheat oven to 400 degrees. 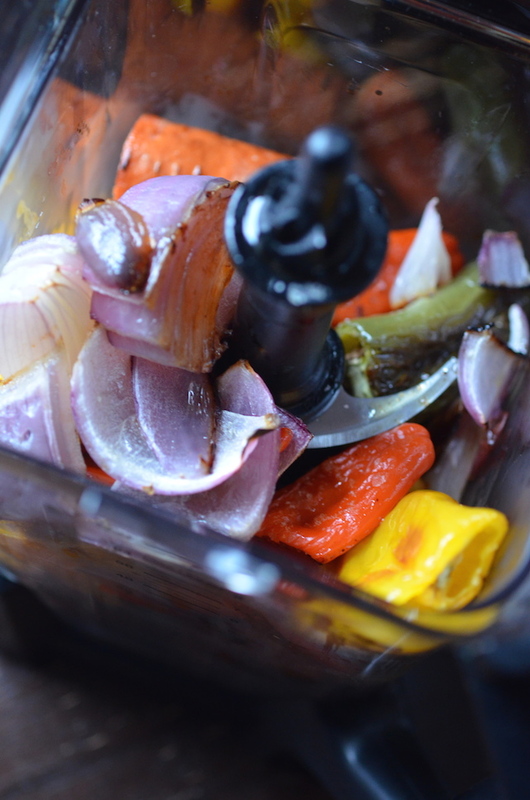 Spread peppers, onions, and carrots on a large roasting pan, and toss with olive oil. Season generously with kosher salt. Roast 20-25 minutes, tossing once halfway, or until all ingredients are soft and with a slight char. Let cool 10 minutes. Combine vegetables with 2 cups of the broth, the garlic, and the ginger in a blender and puree until very smooth. 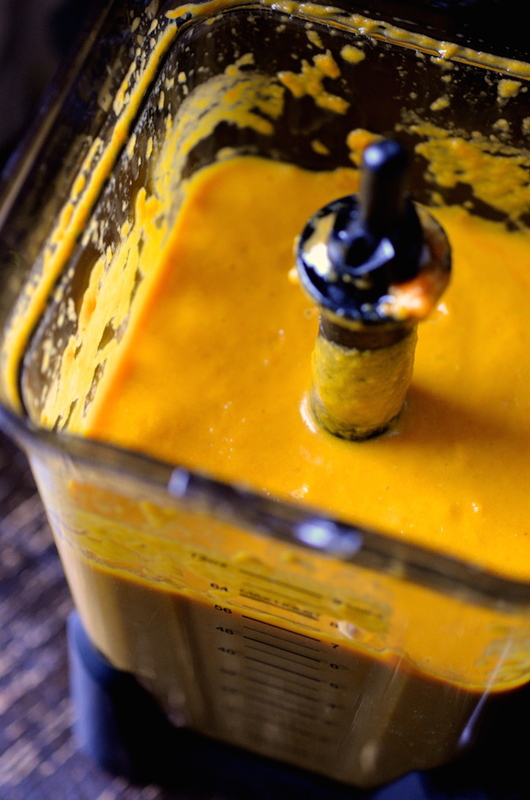 (Depending on the size of your blender, you may need to do this in batches. Less powerful blenders will require longer blending time.) Add more broth as desired for a thinner soup. Season with salt and pepper to taste. Serve with lime wedges and scallions.